Finally a good resident evil game. It's a miracle! This one might be my fav of the series. It takes the Resident Evil formula to an entirely different level, going from the standard horror tropes to a campy medieval setting to a military compound. It has it all. Add in some solid gameplay mechanics and one particularly great shopkeeper and you have a different direction for Resident Evil but one that still works wonders. 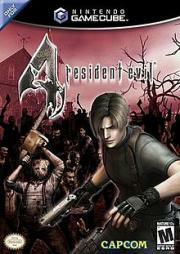 An amazing action game, but a very poor Resident Evil game. After shooting through what was maybe the 3000th zombie horde, I got bored and stopped playing. I knew the game received great reviews, I really want to like it, but all I found was a mind-numbingly repetitive game. It is undeniable that this is a major improvement on the first three in regards to the controls. Even in regards to story. However the fourth meanders a little too often and doesn't lend itself to a lot of replayability. Despite the sincere efforts from Capcop to do so. Far and away the best entry into the Resident Evil franchise, and possibly my favorite game of all time. It's hard to find any fault with Resident Evil 4. Tons of replay value, interesting and varied environments, terrifying enemies, excellent shooting mechanics and weapon varieties, the list goes on. There's a reason I've bought the game multiple times on multiple platforms. NOW we're talking. To this day it's the only RE game that I legitimately enjoyed playing. It improves absolutely every aspect of the previous games while retaining the depth and challenge. As someone who was never obsessively into the older Resident Evil games I gotta say I had a fun time with this one, melding horror and action and arcade-y shoot-'em-up into a bloody, cheesy Grand Guignol minor masterpiece. The game is oddly perfect on the Wii. I had so much fun with it and I think the fact that it has a much different gameplay approach aided the game so much from how dated survival horror was starting to get. It's such a wonderful game that I don't even mind the Ashley levels (though it gets docked points for the Ashley levels!). I have to wonder if this game contributed to a larger shift away from survival horror to action games with horror themes, in the way that it certainly changed its own series at the least. Despite my dissatisfaction with that overall change in video games, I can\'t hold it against a game that was this enjoyable.